It's lovely to paint boats in the harbor in Yarmouth, Maine. But on a hot afternoon, finding a place to stand in the shade becomes a priority, even if it means looking in the other direction. 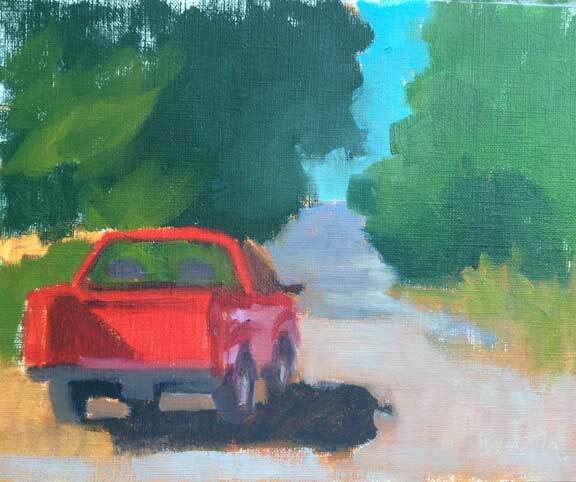 And a lobsterman's red pickup makes a good subject too! It's September tomorrow, and time for another 30 paintings in 30 days. Thanks to Leslie Saeta, who once again has signed up hundreds of artists to participate in this fun event. Take a look at Leslie's blog each evening to see all the paintings.